Adorable glazed ceramic measuring spoon set from Pier 1 imports. Like new, never used condition with no chips or damages. Perfect fun baking accessory for holiday baking with the kids. Vintage Hazel Atlas frosted batter jug or syrup pitcher. It has "Little Black Sambo" on it. Popular for Sambo's restaurant. This one measures 9" tall. There are no chips or cracks and the paaint and graphics are pristine and crisp. Lid works perfectly too. Amazing condition. Made by Harmony House in 1952, this pretty bread and butter plate measures 6 1/4" at the widest point. Pretty single pink blooming rose bud in the center. This is from their dinnerware line by Universal which is ovenproof, and US Union made. Back also states Symphony, Betsy Rose. Perfect with no chips or cracks. Color is vivid and bright. I have 2 in this size. 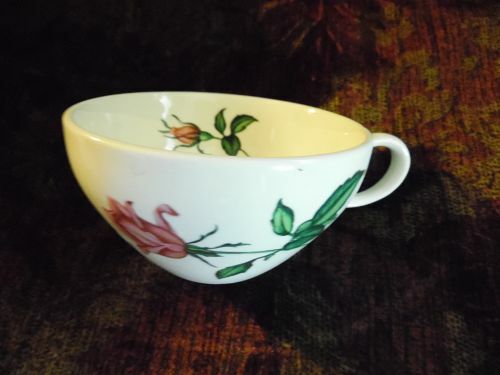 Made by Harmony House in 1952, this pretty fruit / sauce bowl measures 5 3/8". Pretty single pink blooming rose bud in the center. This is from their dinnerware line by Universal which is ovenproof, and US Union made. Betsy Rose pattern. Perfect with no chips or cracks. Color is vivid and bright. I have 5 available. Check my catalog for other pieces to this pattern. Made by Harmony House in 1952, this pretty tab handle cake plate measures 13 1/4" at the widest point. Pretty single pink blooming rose bud in the center. This is from their dinnerware line by Universal which is ovenproof, and US Union made. Back also states Symphony, Betsy Rose. Perfect with no chips or cracks. Color is vivid and bright.I have 2 in this size. Unusual vintage rhinestone set has large light blue rhinestones alternating with white frosted stones.All set into a silver tone setting. Stones are prong set. Earrings have clip backs and are just over 1" square. Tennis bracelet is 7 1/2" long. All stones are intact and nice. Very pretty set.Excellent condition and no makers marks. Beautiful vintage geometric triangle matching pin and earrings with large faux pearl drops. Pretty triangles with center amethyst stone and encrusted with small white rhinestones. Pin is almost 3" wide. These are all on the original cards and have never been worn. All marked Monet. These are AWESOME. Sold as a set. Beautiful Trifari V shaped necklace with shiny gold tone. Set with large white cabochons, (the largest being 1". Market Trifari/ Excellent condition, and looks as if has never been worn. 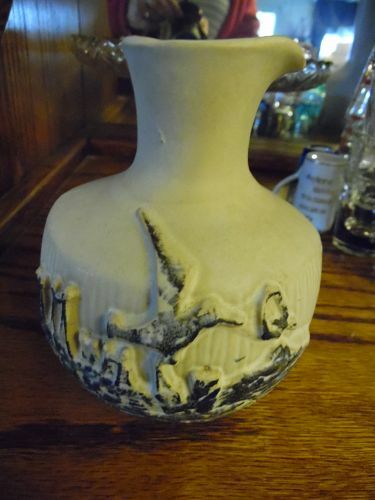 Lovely 1950's Cerama-Stone Laurel of California pitcher ewer. light cocoa brown color. Perfect condition with no damages. Measures 10 3/4" tall. 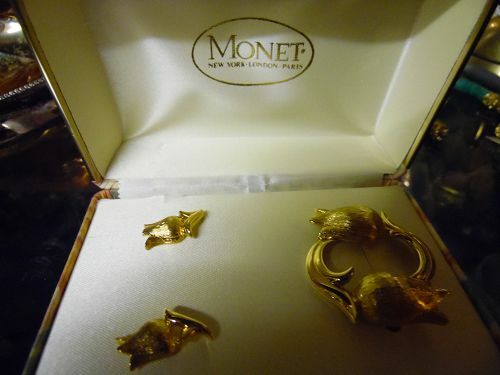 Vintage 80's - 90's Monet post with safety clip, back earrings. 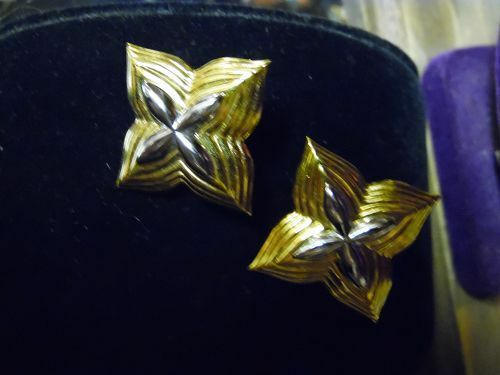 Four point star shape gold tone with silver tone centers. Measures 1 3/4". Shiny and looks like new. 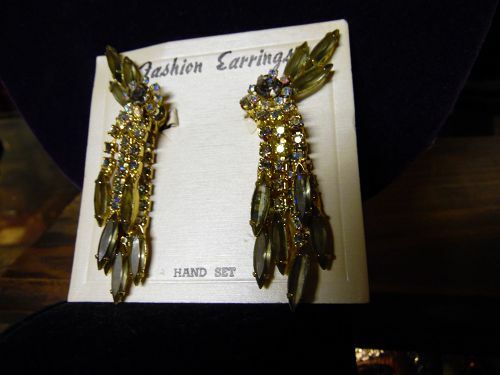 Beautiful hand set rhinestone runway earrings with clip backs. Gorgeous prong set lavender aurora borealis stones, with smoky marquis at the ends and tops. On their original card and they almost look a cockatiel. They have 6 independent suspended rows of stones, which shimmer at the slightest movement. Measures 3" long. Clip backings, and have never been worn. Vintage chunky mod style necklace and matching clip earrings. 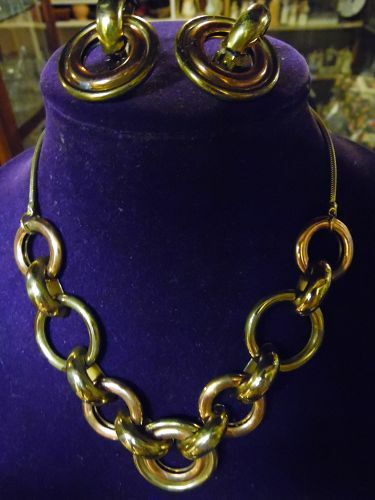 Large links of copper tone and gold tone with a serpentine chain. Adjustable with hook clasp. Matching earrings have clip backings No makers mark. 17 1/2" long. 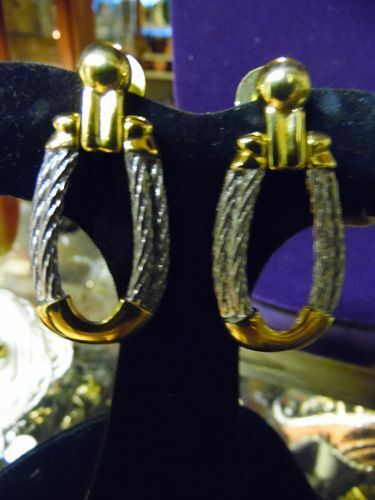 Earrings have a diameter of 1 1/4". Pretty pierced post back earrings. AFJ American fashion jewelrey. Marked AFJ on each. Silver double rope twist with gold tone enhancements. Measures 1 7/8" total length. Pristine condition.